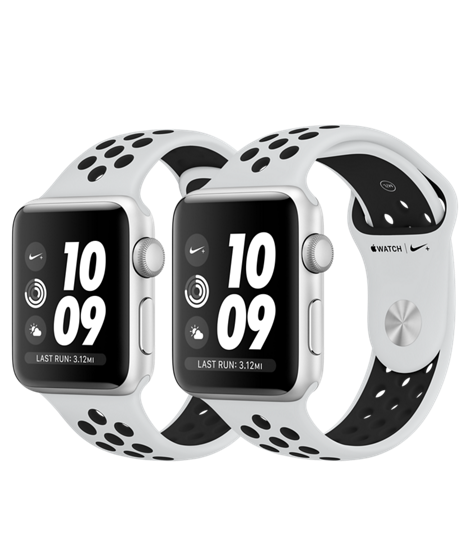 I ended up purchasing the Apple Watch Nike+ Silver Aluminum Case with Pure Platinum/Black Nike Sport Band, as shown in the original post picture. The size is 42mm and costs $359. Since I had a Best Buy store credit amount, I was able to get the final cost below $300. Now to the good stuff. Here are my Pros and Cons of the Apple Watch Series 3. Notifications on iPhone are mirrored on Apple Watch. There were many times that I missed notifications on my iPhone, since I was away from my device or I just didn’t notice the notification because the iPhone was in my pocket. With the Apple Watch, I’m able to get clear notifications as my Watch will vibrate on my wrist. Activity app on iPhone is more useful with Apple Watch. When working out or running, you can get real-time info on your heart rate, active calories burned, etc. This makes your workouts more worthwhile. Furthermore, there are Activity app challenges that actually make you want to exercise and stay more active. There is even a feature that reminds you to stand every hour, so you are not just sitting all day. Using Apple Watch with Camera app on iPhone. Rather than setting a timer on the iPhone Camera app to take a group picture with you in it, you can trigger a picture snap by using the Camera app on the Apple Watch directly. Full charge on Apple Watch lasts only 1-2 days. This was one of the main reasons why I was hesitant to use an Apple Watch in the first place. I eventually realized this wasn’t the deal breaker that I made it out to be. Basically, I just put the Apple Watch magnetic charger on my bed stand and then discipline myself to put the Apple Watch on the charger before I go to sleep every night. In the event that you forget to charge your Apple Watch and your charge is nearing 0% during the day, the Apple Watch will go into Reserve Mode, which blocks all functions except for a simple time display. Apple Watch Series 3 will be obsolete in 2-3 years. Currently, Watch OS at version 4. I’m sure in the next few years, there will be new Watch OS releases and, eventually, my Series 3 will not be able to handle the new OS. Also, the Watch battery will degrade and the battery life would not even last a few hours. Tethering to iPhone not required for outgoing/incoming calls. Strangely, you may wonder why I put this as a Con rather than Pro. Unfortunately, the Watch Series 3 Cellular version costs $40 extra. Although you do get an additional 8 GB of RAM for 16 GB total, the battery life of the Apple Watch is significantly reduced every time a phone call is made/received directly on Apple Watch. I always have my iPhone in close proximity to me, so I would rarely need make/receive calls on my Apple Watch separately. Therefore, I saw no need to get the Cellular version, as I value battery life than making/receiving phone calls. Overall, my Apple Watch Series 3 was a good purchase short-term. However, long-term, as the Series 3 eventually becomes obsolete, I’ll either have to purchase an new Apple Watch Series or resort to my forever, reliable, and never obsolete Rolex time/date piece.